Whether you feed birds throughout the winter or year round, it’s important to practice good bird feeder and bath hygiene. 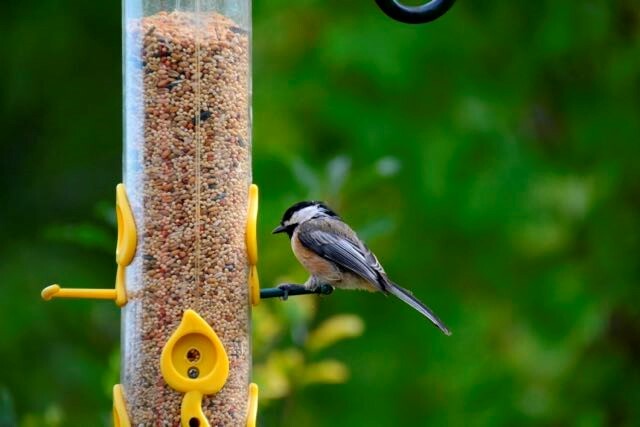 Dirty feeders and baths not only expose birds to potential toxic molds and bacteria, they can also spread diseases and viruses that are harmful to bird and human health. Baths may also house mosquito populations, which can be an additional source of viruses, such as West Nile. To avoid spreading contagions and viruses among birds and humans, it’s important to clean and disinfect feeders and baths regularly, even in winter. We recommend eco-friendly products that biodegrade quickly and won’t pose any harm to wildlife, especially given how sensitive birds are to chemicals. Oxygen bleach (a non-toxic bleach), borax (a non-toxic disinfectant used in hospitals), or vinegar-based cleaning regimens are the best ways to protect animals and humans. Oxygen bleach: use 1 part oxygen bleach to 10 parts water, so ½ cup bleach to 5 cups water, or ¼ cup bleach to 2.5 cups water. Borax: use 1 cup of borax for 16 cups of water, or ¼ cup borax for 4 cups water, or 1/8 to 2. Vinegar: use a 50/50 water/vinegar mixture, or 1 cup vinegar to 1 cup water. It is best to allow feeders and baths to soak in the mixture. Feeders should be fully submerged. Baths do not have to be submerged, but make sure the entire bath is filled with the mixture. Baths should be either cleaned inside or covered during soaking to prevent birds accessing the bath during disinfection. After soaking for a bit, give the feeder or the bath a good scrub – rubber gloves are recommended. 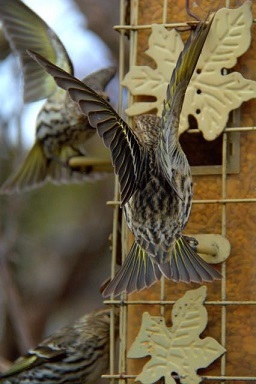 For feeders use a bottlebrush and something similar to scrub the birdbath. After you are done scrubbing, give it a good rinse and make sure all residue is gone. The bath can be refilled right away with clean water. The feeder should be air dried completely before being refilled to avoid mold. 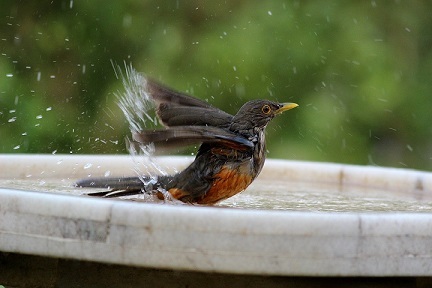 The bath should not be too close to the feeder to avoid seed falling into the bath. If you notice sickly birds at your feeder or bath then cleaning should happen once a week at a minimum. Otherwise, feeders should be washed every 2-4 weeks, while baths should be washed every 2 weeks or more if you notice algae growth. The best way to avoid algae growth is to change the water regularly: instead of adding new water, dump the old water (into the garden) and then add new water. If you change the water daily you can reduce the need to scrub and wash. You can also try a capful (not a cupful) of apple cider vinegar to reduce plant growth. Last quick notes: Make sure that after the snow has melted you remove all spilled seed – the warm weather can quickly turn seed moldy, and even spread salmonella. And don’t forget to put a couple of rocks in your birdbath to ensure smaller birds don’t drown. healthy feeding and bathing from you!